Click HERE for the press release in Korean. Click HERE for the update in Korean. We are exposing the dirty secret of how dog meat farms were able to be formed and operated in South Korea, the only nation in the world where dogs are bred in factory farms in which hundreds or even thousands of dogs are raised by only one or two people. 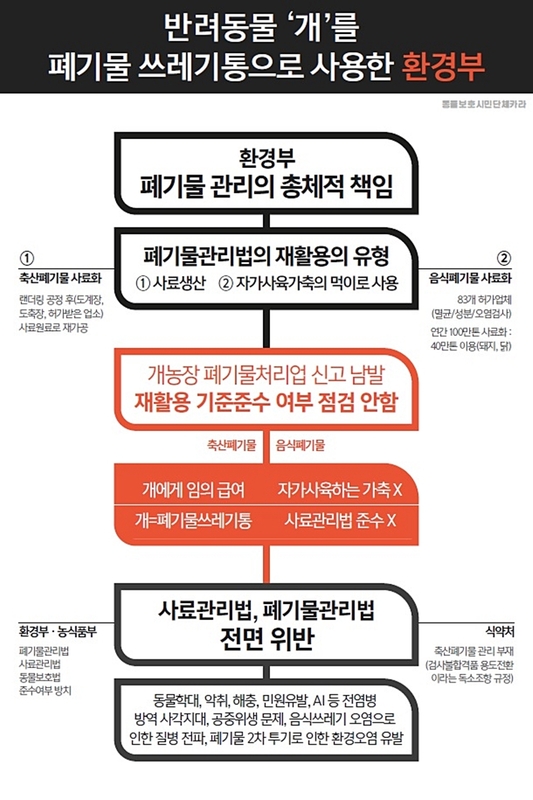 According to Korea Animal Rights Advocates (Director: Soon-Rye Im, hereinafter referred to as KARA), it was discovered that the Ministry of Environment was neglecting to properly manage food waste by allowing illegal disposals. 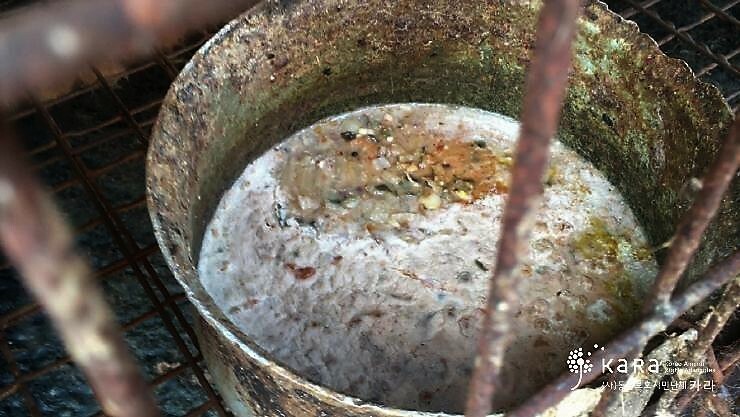 By exploiting the laxity of the Ministry of Environment’s management of food waste, dog meat farms were able to grow to such immensity with free illegal food and livestock waste. According to the Control of Livestock and Fish Feed Act, for food waste to be processed and distributed as animal feed, it must first be transferred to an authorized recycling facility where it is sterilized and tested for contaminants such as salmonella and residual selenium content. In 2016, 83 of such recycling facilities processed 1.1 million tons of food waste, and distributed to pig farmers 400,000 tons (approximately 37%) of the recycled food waste collected. However, the Ministry of Environment issued food waste processing licenses to dog farm owners who wanted to collect food waste, without ever inspecting or checking these dog farms to ensure compliance of standards. By granting non-discriminatory waste management authority to dog meat farm owners without supervising their abidance of the Control of Livestock and Fish Feed Act, the government contributed to rampant animal abuse, threats to public health, complaints of odor and pests, as well as the environmental pollution caused by the secondary dumping grounds. Even more serious is the extent of the mismanagement of livestock waste. Management authority of livestock waste, which must be thoroughly recycled or disposed of, was issued to the dog farms, which is like a free pass for prevention of epidemics. This is no different than the complete collapse of the system to prevent contagious zoonotic diseases such as avian influenza. The response of the Ministry of Agriculture, Food and Rural Affairs has been a complete shame with neglect of responsibilities reaching the level of “waste terror”. Remaining unaware of the severity of the situation, they prohibited distribution of recycled food waste wet slops only to poultry, not to dogs. 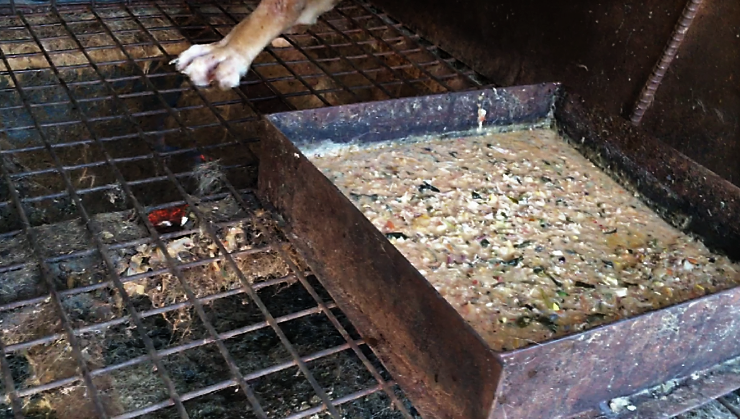 Despite a significant decrease in the consumption and demand of dog meat soup and a slump in the price of dogs, dog meat farms have been able to stay in business due to the systemic and illegal support of the Ministry of Environment. Their lack of concern for animals permitted dog meat farms to feed dogs free waste they were paid to take and treat dogs as living garbage cans. 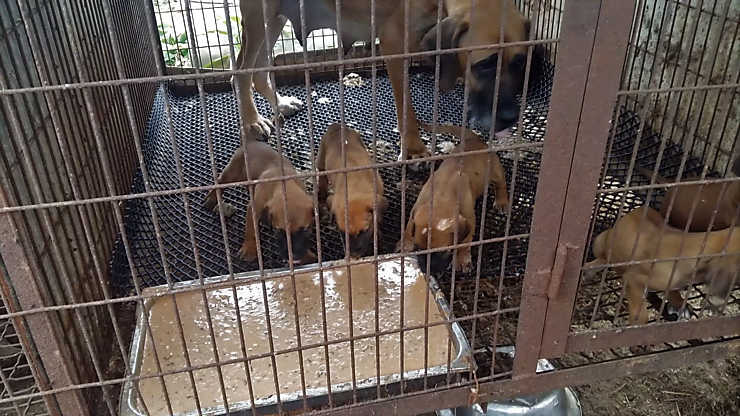 As a result, among the 33 total registered waste management businesses in Gimcheon in Gyeongsangbuk-do Province, 6 farms had unverifiable types of livestock while the other 27 reported that they operate a dog meat farm and they intend to use the waste to feed their dogs. 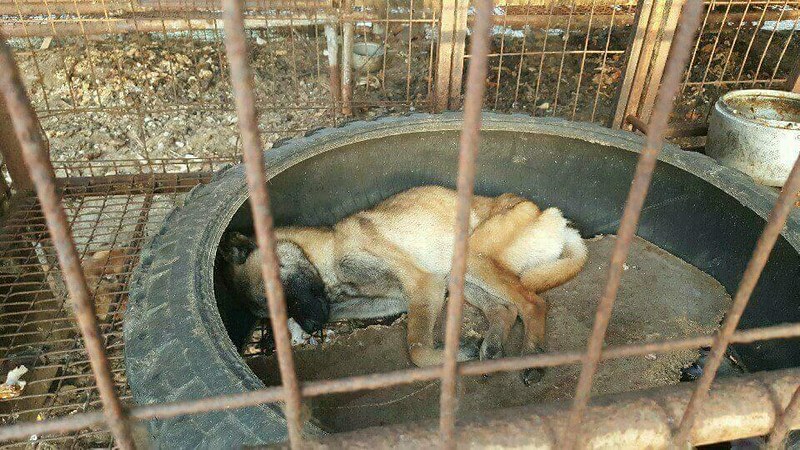 One of these dog meat farms, JeonOO farm, reported that he raises 370 dogs and collected food waste from 25 large dump sites, including one university, one high school, one middle school, and nine elementary schools. It is unrealistic that 370 dogs could consume such a huge amount of food waste, leading us to suspect secondary trade, disposal, or illegal sale of these food wastes. It is speculated that the money received for waste collection could be enormous. In particular, the recent outbreak of avian influenza, which resulted in the unprecedented mass culling of 40 million poultry, started at a slaughterhouse (OO Food, Inc.) located in Eumseong, Chungcheongbuk-do Province. Of the 22 animal waste management businesses that collected the waste from this slaughterhouse, a whopping 10 businesses were confirmed to be dog meat farms. 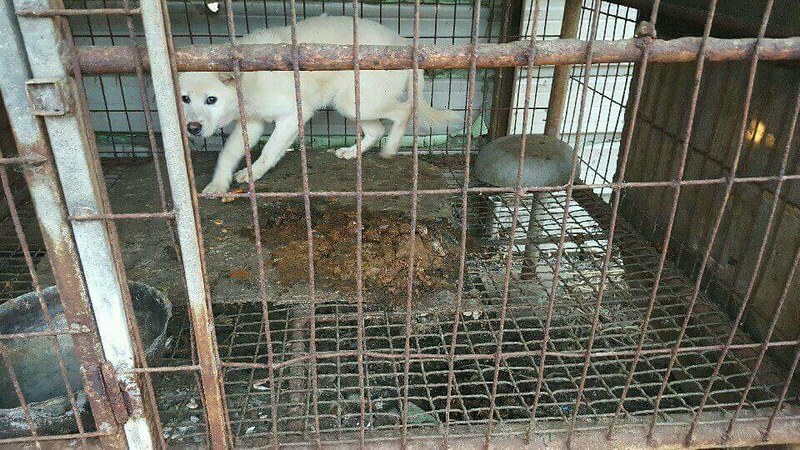 The 10 dog meat farms were located in Goesan, Eumseong, Jincheon, Chungju in Chungcheongbuk-do province and as far away as Gimpo in Gyeonggi-do province. 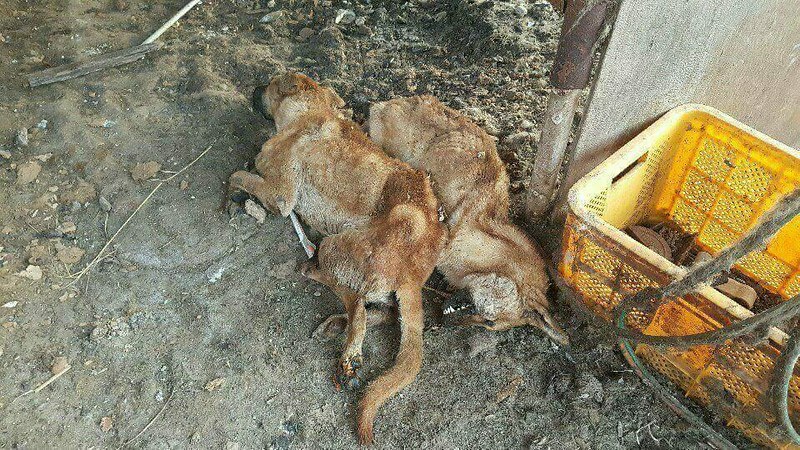 In another case, a dog meat farm in Naju, Jeollanam-do Province was found to be collecting large amounts of livestock waste not only from the duck slaughterhouses in Jeongeup, Jeollabuk-do Province, but also from ones located as far away as Paju, Gyeonggi-do Province. Shortly after the press conference on the 11th, KARA, to find resolution to the problem, requested a meeting with the Minister of Environment and demanded that they conduct an immediate nationwide survey of distribution of food waste to the dog meat farms. I think these dog and cat meat farmers are Satanists and have the blood of Adolph Hitler running through their veins and they have no souls nor do the deamons who eat them. You make me sick. This greedy behavior shows ignorance and a disrespect for life. These are God’s creatures and what goes around comes around. This is no way to treat any living thing. This is pure inhumane and barbaric reptilian act. Animals deserve respect and care. They are not just money making objects or food. They treat these dogs worse than dirt. No living creature on earth should be treated this way. 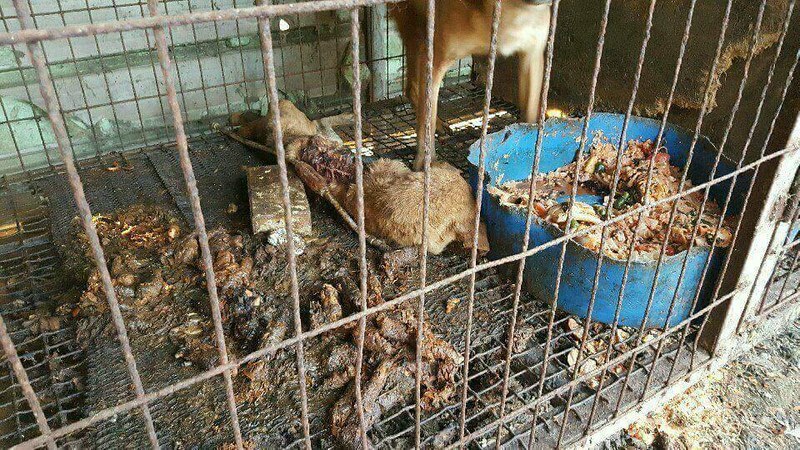 These Korean dog farmers are human waste and they should be locked up in cages and forced to eat garbage. These monsters are barbarians from the middle ages. When will this PET CRUELTY AND MURDERING finally end????!!!! Time to STOP IT NOW!!!! This breaks my heart. Please pass and enforce laws to help these poor dogs. The need compassion and help. I hope President Moon can and will end this madness. All this is so absolutely horrifying – I wish so deeply and beg to God that it stops!!!!!!! PLEASE STOP THAT EXCRUCIATING CRUELTY!!!!!!!! Please. This cruelty needs to stop. The government needs to step in and regulate these farms properly. Regulate these farms??? They need to be shut down. Dogs do not belong in cages and they shouldn’t be eaten. A nation of people who abuse animals lack compassion and love for its animals. They are heartless and cruel human beings. Our animals can be companions for lonely people, and leaders for blind people, and more. Any country whose people lack respect, gratitude and compassion. Dogs are sentient, feeling, loving animals. They need shelter, food, and good health–not much to ask in return for what they give of themselves. Don’t let your country continue to be a Third World Country. I am asking you to take care of the dogs in your community. They are wonderful companions among other things. A nation of people who abuse animals lack compassion and love for its animals. They are heartless and cruel human beings. Our animals companions for lonely people, and leaders for blind people, and more. Any country whose people lack respect, gratitude and compassion. Dogs are sentient, feeling, loving animals. They need shelter, food, and good health–not much to ask in return for what they give of themselves. Don’t let your country continue to be a Third World Country. These people are devils, I hope they will burn in the hell and loose there soul for every time. They are a shame for South Korea. What a poor culture!!! what a huge shame that disgusting, but is it possible that everyone pretends not to see ?! Heartbreaking disgusting and barbaric… there are no words of how disgusting I think the people that are involved in doing this to these beautiful creatures and I mean all involved! Shame on you! You should be concerned about Karma! I can’t imagine it will not find you… and soon… no one can get away with this kind of brutality and get away with it! Just heartbreaking! We are watching you and we know what you are doing… the world knows! This is beyond disgusting and heinous. These poor dogs suffer so much at the hands of cruel, uncaring barbaric people. This horror must be stopped now! Never felt so sick in my life. The Korean barbarianism is far beyond what one can possibly imagine. It serves to emphasize the ignorance, mental depravity, careless disregard for life, illiteracy of a group of people who should e obliterated from this planet. This segment of Earth’s population regardless of country contributes NOTHING to the well-being of everyday citizens, and those who participate in this despicable activity should be destroyed. Of course, this is my personal opinion, and I suspect this view is shared by anyone who has ever had the pleasure of a dog’s companionship covering many areas of human/animal interactions. For G-d’s sake this has to STOP!!! The trouble is nobody is listening. It has been going on for centuries. You need some army whoever to go in and eradicate these filthy farms and side streets where the butchering is going on. Make these people grow vegetables etc. Thinking that torture somehow makes the meat more tender is stupid and they know that they just want to cause pain and suffering to these poor animals. Zero tolerance for animal abuse! I am angry and heartbroken. Those who have such a blatant disregard for the life and spirit of these innocent dogs, or any animals for that matter, are just evil. Those despicable human beings responsible for this nightmare should be treated the same as those poor dogs, cage, same food etc. and then slaughtered the same. That is what they deserve but I could live with a quick bullet to their heart and leave them to die. Evil like that does not belong on earth. I am glad there are some people in South Korea who care enough to fight. I beg this new Prime Minister to end this cruelty, and cruelty to all animals. no respect of humans, animnals and the nature! This behavior is criminal, not only to the poor animals, but also the human and the whole environment! I do not want to deal with such countries! One more reason not to waste my tourist dollars on Korea. This is one of the most barbaric, savage and disgusting things I’ve seen in a long time; it’s hard to believe any human being could know about this and not work to stop the inhumane and horrific suffering of these dogs. Shame on Korea. Finally ends this torture kg zur dogs, Tiere is enough others thank eating dog meat!!!!! It is a schäme dir für Country…. it is disgusting and immoral!!!!! This is the most barbaric, cruel, unbearable act against these poor innocent animals! We should stop it right now and the people responsible for doing such tortures to dogs and cats and finally slaughter them, should be sentenced to the fullest extent of the law! The world cannot allow this to continue happening, for God’s sake! We need to be stong and reolute against this barbaric industry, a heinous practice that has been uncovered by millions of people around the world. It is enough!!! We can stop this cruelty. they should be getting funds for it. This must stop. We are disgusted by the treatment of these beautiful animals. This must stop. We are disgusted by your ttreatment of these beautiful animals. STOP THIS! FREEDOM FOR ANIMALS! THEY ARE OUR FAMILY, NOT FOOD! Proverbs 12v10 A righteous man regards the life of his animal, But the tender mercies of the wicked are cruel. Hell will come your way if you don’t stop this treatment of these beautiful animals. Hell is real .